Ettari / Hectares: 0.6 Ha. 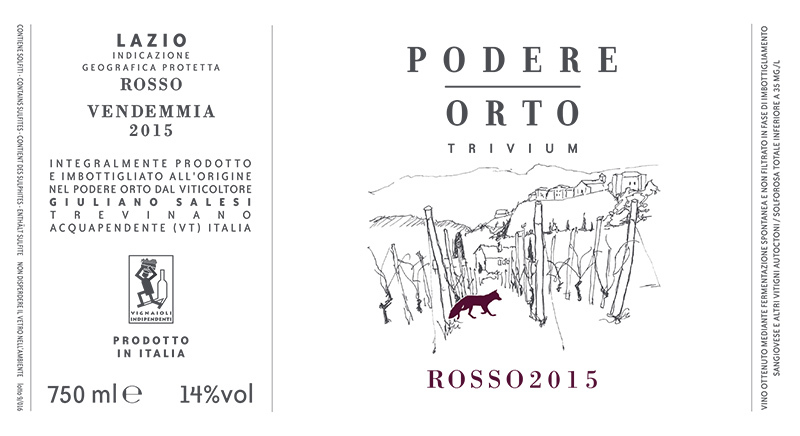 Quota / Altitude: 630 m / 2067 ft.
Vitigni / Varieties: Sangiovese 45%, Grechetto Rosso 45% and Ciliegiolo 10%. Data di vendemmia / Harvest date: first 20 days of October. Fermentazione alcolica / Alcoholic fermentation: 15-20 days in stainless steel and fiberglass, non temperature control intervention; three punch downs a day. 50% whole bunches. Fermentazione malolattica / Malolactic fermentation: Native bacteria, in the spring after the alcoholic fermentation. Affinamento / Élevage: 12 months in 1000/1200 liters stainless steel and fiberglass tanks; 12 months in bottle. Zolfo / Sulphur: 32 mg/L total, 20 mg/L free. Produzione annua / Annual production: 500 cases (6x750ml cases).